Physical Therapy at acac has full access to the warm-water therapy pools at Albemarle Square and Downtown acac Fitness & Wellness locations. We utilize the warm-water therapy pools, maintained at 94 degrees F – to provide a soothing, relaxing environment for painful joints and muscles. The pool depth ranges from 3.5 feet to 7 feet with ample room for walking and other aquatic exercises. At both Albemarle Square and Downtown locations, PT@acac has access to a larger activity pool that is kept at 85 degrees F for those patients who do not tolerate the warm water temperature or need a higher intensity aquatic program. What are the benefits of Aquatic Therapy? water provides resistance to movement while also providing some support, allowing gentler strengthening than what would be done on land. Aquatic physical therapy applies standard physical therapy methods and principles, but with the patient in the water. 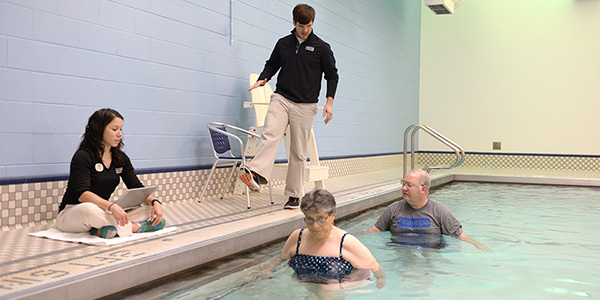 Before intiating aquatic physical therapy, the patient will be evaluated by a physical therapist in the clinic, and a personalized plan of care will be determined. Most patients are guided through these exercises with the therapist on the pool deck; however, should you require a higher level of assistance, the therapist is able to be in the water with you -- whatever it takes to ensure patient safety and comfort.